On Tuesday, now-former Sen. Al Franken (D-MN) officially resigned from the U.S. Senate following allegations of inappropriate behavior toward women. As we discussed in our last newsletter for 2017, Franken’s resignation means that Minnesota will hold a special election for Senate this coming November, which will take place at the same time as the regular election for the state’s other Senate seat (a “double-barrel” election). Franken’s exit paved the way for Gov. Mark Dayton (D) to officially appoint now-Sen. Tina Smith (D), previously Minnesota’s lieutenant governor. This makes Smith the 195th appointed senator since the ratification of the 17th Amendment in April 1913 initiated the era of popular elections for Senate. Smith intends to run in the special election in November 2018 to complete the remainder of Franken’s term in office, with the next regular election for the seat scheduled for 2020. Should she run as expected, Smith will be 126th appointed incumbent to seek election while in the Senate. Of those 125 previous appointed Senate incumbents, 117 sought election for a full or partial term that went beyond the end of the current Congress. 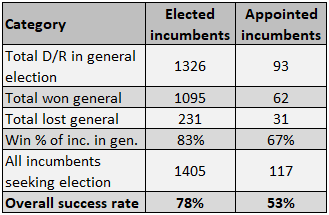 Unsurprisingly, appointed incumbents have a worse track record than elected incumbents, in both contests for renomination and in general elections. Since 1913, 1,405 elected incumbents have run again. Of those, 1,392 sought renomination as Democrats or Republicans, and just 85 lost renomination. That is, only 6% of elected incumbents lost their nomination fight in their party’s primary or at a party convention. (Note that these data do not include incumbents who won renomination but then died prior to the general election.) Conversely, 117 appointed incumbents have sought their party’s nomination for an election to go beyond the current Congress (in eight other cases, appointed incumbents ran in a special election to serve the few remaining months of a term and did not seek election beyond the current Congress — see footnote 1). However, of those 117, 11 were actually appointed to the Senate after winning their party’s nomination and another three ran in all-party special election formats that did not have a party nomination process. So of the remaining 103 appointed incumbents who sought their party’s nomination, 24 (23%) lost their party’s primary or convention. This figure includes the most recent appointed incumbent to lose in a primary, ex-Sen. Luther Strange (R-AL), in Alabama’s recent special election. While the sample size is far smaller for appointed incumbents, elected incumbents have won renomination at a much higher rate, 94% versus 77%, than appointed incumbents who took office prior to seeking their party’s nomination. Table 1 lays out nomination data for elected and appointed incumbents. Notes: Elected incumbent data do not include those who won renomination but then died prior to the general election. Appointed incumbent data only include those who were seeking their party nomination after being appointed to office. Appointed incumbent data do not include cases where an appointed senator ran in a special election to serve the few remaining months of a term and did not seek election beyond the current Congress — see footnote 1. While Smith seems to have the backing of most major players in the Minnesota Democratic-Farmer-Labor Party, history suggests that we shouldn’t entirely discount a notable intraparty challenge to Smith. If she does encounter serious opposition, it will almost certainly precipitate a contested primary for the seat. Minnesota’s parties can endorse candidates at their party conventions, and many candidates choose to abide by the party’s decision. However, candidates can opt to run in the primary with or without the party’s endorsement. Previous appointed incumbents who ran in primaries have found success more often than not, though not at a very high rate. Of the 103 appointed incumbents who were installed in office prior to seeking their party nomination, 86 have run in primaries, and 62 have faced primary opposition. Overall, 38 of the senators who faced primary opposition won their party primary (61%). Perhaps fortunately for Smith, there is no runoff statute in Minnesota — all six appointed incumbents who went to a primary runoff met defeat, including Strange. While we can’t know how things will shake out in Minnesota’s special election, the early showings of support for Smith suggest that she’s probably not going to challenge for the worst primary performance in appointed Senate incumbent history. Table 1 shows the 10 worst primary performances by appointed incumbents. Notes: An “*” signifies that the primary was for a special general election and an “N” signifies that the special general election did not take place on the first Tuesday in November. These primary data do not include cases where an appointed incumbent lost a primary for an election to finish off the term for the remainder of the current Congress but did not run in the primary for the general election for the next term. Strange, the most recent appointed incumbent to lose a nomination contest, had the ninth-worst primary percentage ever, but he did far better than Sen. Herbert Hitchcock (D-SD), who was appointed right at the end of 1936. Hitchcock finished a distant third in his party primary in 1938, losing by about 50 points to former Gov. Tom Berry (D). Ironically, Berry had appointed Hitchcock to the Senate just prior to leaving office as governor following a reelection loss in November 1936. Berry went on to lose in the 1938 general election, one of eight Republican pickups that year. The second- and third-worst primary performances by an appointed incumbent both took place in Montana, which is one of eight states to never have an appointed incumbent make it to a general election. In 1933, Montana Gov. John Erickson (D) had just been reelected to his third term when Sen. Thomas Walsh (D) died, creating a vacancy for his seat. Erickson resigned the governorship and had his lieutenant governor appoint him to the seat. Erickson ran for his party’s nomination in 1934, but clearly he wasn’t as popular as he seemed because Erickson only won 22% of a heavily fragmented primary vote, losing to James Murray, who won 25%. More recently, Paul Hatfield (D) was appointed in January 1978 to take the place of the deceased Sen. Lee Metcalf (D). But Hatfield was crushed in the Democratic primary by Rep. Max Baucus (D, MT-1), who won the 1978 general election and held the seat until he resigned in 2014 to become ambassador to China. What about appointed incumbents versus elected ones in general elections? Here, too, elected incumbents have a far stronger record than appointees. Including third-party incumbents and a few instances where an incumbent ran in the general election after losing renomination in a party primary, elected incumbents have won 1,095 of 1,326 elections, an 83% win percentage, in the popular election era. Meanwhile, appointed incumbents have won 62 of 93 elections, a 67% success rate. The appointed incumbent data include those who were appointed after being nominated by their party. Looking at overall success — running and then winning a general election — 1,095 elected incumbents have successfully sought reelection (78%) while only 62 of 117 appointed incumbents seeking election beyond the current Congress have managed to win in the general election (53%). Notes: Elected incumbent data do not include those who won renomination but then died prior to the general election. Appointed incumbent data only include those who were seeking their party nomination after being appointed to office. Appointed incumbent data do not include eight cases where an appointed senator sought election to finish off the term for the remainder of the current Congress but did not seek office for the next term. Appointed incumbent data for general election success do not include the case of Sen. Frank Graham (D-NC), who lost in North Carolina’s 1950 Democratic Party primary runoff but won 0.4% as a write-in candidate in the general election. The evidence showing appointed incumbents are weaker than elected ones corresponds to what we intuitively know about electoral politics. Some of the electoral strength that comes with incumbency is derived from the fact that incumbents have previously gone before the electorate and won more votes than anyone else. Appointed incumbents don’t have that same strength because they haven’t been elected to the office they hold. An analog to appointed Senate incumbents are successor gubernatorial incumbents, a subject the Crystal Ball examined in May 2017. At least going back to World War II, successor governors — defined as those who took office because of the death or resignation of the previous governor — won at a rate of 63%. That compares favorably to the all-time appointed Senate incumbent success rate of 53% and also to the post-World War II success rate of 48% for appointed Senate incumbents, if we make an apples-to-apples time comparison. With an overall success rate of just above 50%, the history of appointed incumbents shows that Smith’s certainty of holding her seat is far from a sure thing. Placing Smith’s position in context, we only rate her chances as Leans Democratic to start with. She may be aided by the presence of her popular colleague, Sen. Amy Klobuchar (D), on the ballot as well as what may be a positive national Democratic environment. However, Smith has not run for office on her own before — she was elected lieutenant governor as a part of Dayton’s 2014 ticket — making her an unproven choice in that respect. It’s also possible that the Minnesota GOP will pick a strong nominee — a favorite rumored choice is former Gov. Tim Pawlenty — who can make the race competitive. Minnesota is a state that has been trending Republican at the presidential level for some time, the GOP flipped the state senate in 2016, and Minnesotans showed a willingness to split tickets in 2016 House races, though more to the benefit of Democrats than Republicans. However, it’s also possible that Minnesota Republicans could err in their nominee choice: former Rep. Michele Bachmann (R) is reportedly thinking about a run, and she barely won reelection in 2012 in what is arguably Minnesota’s most Republican House district. To close out, we’ll add a few more fun facts and figures about appointed Senate incumbents going back to 1913. While Luther Strange was the most recent appointed incumbent to engage in an election, the first was Sen. Johnson Camden Jr. (D-KY) in 1914. However, Camden only ran in a special election to finish off the term for his seat and did not run in the concurrent election that November for the next term. Camden won to complete the term while John Beckham (D) won the open-seat race for the subsequent term. Thomas Taggart (D-IN) was the first appointed incumbent to seek election for a term lasting beyond the current Congress. Appointed in March 1916 and nominated at his party’s convention in April for the ensuing special election, Taggart narrowly lost 48%-46% to former Rep. James Watson (R, IN-6) in November. The year with the most elections featuring appointed incumbents was 1946, when nine sought to retain their seats (this includes one non-November special election and excludes candidacies to only complete a few months of an expiring term). Of those, seven made it to the general election, with two having been appointed after winning their party’s nomination. The second-most took place in 1954 (six). At the moment, 2018 only has one such election in Minnesota, but that number might increase. Because of health ailments, it’s possible that Sens. John McCain (R-AZ) and/or Thad Cochran (R-MS) might step aside, and with the national focus on sexual harassment, it’s not impossible to imagine someone else coming under fire and resigning as a result à la Franken. In any of these potential situations, a freshly appointed senator might try to hold onto his or her new office. In the meantime, we will wait and see how the Minnesota candidate field develops and whether Smith has a glide path to her party’s nomination or a tougher time, which would be similar to some of her appointed predecessors. 1. The eight cases that were excluded are as follows: Sen. David Baird (R-NJ), who ran in a 1918 primary for a special election to complete a term ending in March 1919 but not in the primary for the concurrent regular general election for the next term; Sen. Christie Benet (D-SC), who ran in a 1918 primary for a special election to complete a term ending in March 1919 but not in the primary for the concurrent regular general election for the next term; Sen. William Brock (D-TN), who ran in a 1930 primary for a special election to complete a term ending in March 1931 but not in the primary for the concurrent regular general election for the next term; Sen. Johnson Camden Jr. (D-KY), who ran in a 1914 primary for a special election to complete a term ending in March 1915 but not in the primary for the concurrent regular general election for the next term; Sen. Joseph Rosier (D-WV), who ran in a 1942 primary for a special election to a complete a term ending in January 1943 but not in the primary for the concurrent regular general election for the next term; Sen. David Stewart (R-IA), who was nominated at a party convention to be the GOP nominee for a special election to fill a vacancy for a term ending in March 1927 and was subsequently appointed to the Senate; Sen. Walter Walker (D-CO) who was nominated by the Democratic state executive committee to be the nominee for a special election to fill a vacancy for a term ending in March 1933; and Sen. Rose Long (D-LA), who was nominated by the Democratic state central committee to be the nominee for a special election to fill a vacancy ending in January 1937. It should be noted that Sen. Gerald Nye (R-ND) was included in the data although he was nominated by a GOP convention to be a candidate for the June 30, 1926, special election to complete a term ending in March 1927. However, Nye also ran in (and won) the Republican primary for the regular general election that November, which also took place on June 30, signifying that he was seeking to be elected beyond the current Congress. 2. A prior version of this story included the possible departure of Sen. Tom Cotton (R-AR), who has been mentioned as a possible future CIA director, as another potential instance where an appointed senator could end up on the ballot later this year. But according to the Arkansas constitution, an appointee would be ineligible to run for reelection. So we removed the reference to Cotton because his replacement apparently would be barred from running.